I am its #1 fan! in a fun and exciting variety of artisanal flavors! I hope you love them as much as I do." 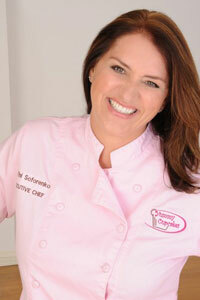 Being a ‘foodie’ and being especially fond of all things cupcakes, Tiffini Soforenko feels she has the best job around! Tiffini is the Founder and Executive Chef of the original Yummy Cupcakes® which has been proudly serving its guests with gourmet cupcakes and gourmet cupcake treats since she created this concept in March of 2004. Tiffini has 19 years experience in operations, special events and guest service. Having worked at Universal Studios Hollywood for over 15 years as Director of Operations, she was a key player in many high profile special events in Los Angeles and was in Osaka as part of the opening team of Universal Studios Japan. Tiffini spent months developing and perfecting her exclusive recipes for all of her cupcakes and now has just over 400 proprietary gourmet cupcake recipes including Vegan, Gluten-less and Sugar-free. Taking cupcakes to a new level, she has also created a line of gourmet cupcake treats to include Cupcake Truffles, Cupcake Truffle Pops, Cupcake Biscotti, Cupcake in a Jar, Cupcakie Pies, Cupcake Parfaits, Cupcake Push Pops, Cupcake Truffluscious, Cupcake Mini Bites, Cupcake on a Stick, Cupcake Stuffies and Frosting Bon Bons. Easy to see why she is a leader in the gourmet cupcake insdustry. Tiffini takes great pride in selecting the ingredients for her recipes. As a Mom of three, she knows the importance of serving real, wholesome, top quality foods. Local, fresh, real, and free if any preservatives or chemicals are just some of the things that set her recipes apart. Tiffini was recently featured on Food Network’s “Unwrapped” as well as on the Rachael Ray Show. Tiffini has also been seen on ABC, KTLA, Fox, Travel Channel, Fox Business News, KCal9 News and EXTRA. She is President of the Advisory Board for Le Cordon Blue College of Culinary Arts and has judged many sweets and cake competitions. Tiffini gives back to her communities in many ways including volunteer time at local schools and nonprofit organizations to teach her art to and motivate aspiring young bakers to go for their dreams. Tiffini lives in Los Angeles with her husband of 17 years…Nik, and their three children, Logan 14, Madison 11 and Bailey who is now 7.